STATESVILLE- Mrs. Eula D. Richardson, 91, died July 4, 2017 after a lingering illness at Gordon Hospice House. Born June 16, 1926 in Iredell County, she was the daughter to the late Douglas Clinton and Estella Redmond Dowell. 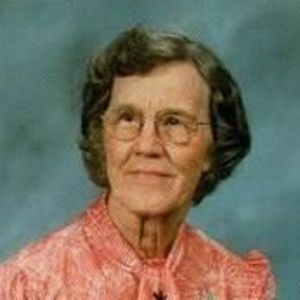 She graduated from Union Grove High School in 1945. On February 12, 1953, she was married to the late Byrd K. Richardson of Randolph Co., North Carolina who passed in 1982. She and her husband made their home in Asheboro, NC where she was employed by Stedman Manufacturing Company. In 1977 they moved to her parents farm in northern Iredell Co., where she returned to public work at Piedmont Garment Company in Harmony, NC and later retired. She was a member of New Prospect Baptist Burch. In addition to her parents and husband she is preceded in death by sisters, Helen and Katherine Dowell; brother, James Dowell and his wife Jean. She is survived by brother, Rev. T. Dwight Dowell and wife, Joyce; nephews, Keith Dowell, Wayne Dowell, Roger Dowell and Gilbert Brimm; niece, Melissa Boyd and numerous cousins. A funeral service will be held on Saturday, July 8, 2017 at 3pm at New Prospect Baptist Church with Pastor Joshua Byrd and Rev. Joey Campbell officiating. Burial will follow in the church cemetery. The family will receive friends from 2-3 pm at the church prior to the service.